Yesterday, I wrote a post based on the descriptions Jesus gave of the Kingdom of Heaven as recorded in Matthew 13. Today I read a sermon about the same passage, published in the book The Seeds of Heaven by Barbara Brown Taylor. Taylor says that one of the characteristics all of the metaphors in this passage share is that they speak of the Kingdom of God as hidden -- perhaps hidden in the ordinary. Why would God hide the Kingdom of Heaven? As that question floated through my mind, another question surfaced. Could it be that it's not that God has hidden it, but that we fail to look for it? Do we need to open our eyes to find what is right in front of us? Where today could you have witnessed the Kingdom? Where will you see it this afternoon, if you will look? What is the kingdom of heaven like? What does Matthew say in Chapter 13:31-33, 44-49? Below is a list of comparisons made in the chapter, paraphrased by me, with my thoughts. The kingdom of heaven is like a mustard seed...the smallest of all seeds that is planted and becomes the greatest of shrubs, like a tree, so that birds come and nest in it. We could perhaps underestimate the power in a mustard seed. We might not imagine what could come of it if planted. Our expectations are that something so small would have insignificant results, but the opposite is true. Perhaps we could never predict the outcome of what we see as small actions for God. Perhaps we would never anticipate the powerfulness of the kingdom of God from what we see. The kingdom of heaven is like yeast mixed with three measures of flour until it was all leavened. When I bake bread, I'm always amazed that the tiny amount of yeast I add will cause two loaves of bread to rise (I usually bake a recipe that yields two or three loaves). The effect multiplies as the yeast grows. Perhaps the kingdom of heaven is like that. The kingdom of heaven is like treasure hidden in a field, which someone found and hid; then in his joy he goes and sells all that he has and buys that field. There is much in life we value -- many things we think are of great value. This tells us that we would joyfully trade all that we have for God's kingdom -- it is of that great a value to us. The kingdom of heaven is like a net thrown into the sea that caught fish of every kind. When the net is brought ashore, the good fish are kept. The bad are thrown out. We should relax, because God will judge -- by relax, I mean stop trying to do God's job. Let God judge. Has God saved you? Has he redeemed you? Do you believe it? By God's grace, we are saved. Could it be that we underestimate the Kingdom of God? Do we see mustard seeds instead of great trees providing homes for birds? Do we forget to believe that the tiny amount of yeast can make the bread rise? Do we forget that value of the Kingdom of God? Remember the power of God, and remember what can be done with the little you can offer. Lives can be changed. Instead of worrying if you are a good fish or a bad fish, remember the power of the God you follow. Believe in God's power to save you -- not only you, but all those you would touch with God's power of love. Is this what this passage is about? I don't know, but it is what I am moved to write today. On of the devotionals I read last week suggested praying Psalm 19. I've often heard the phrase, "praying the psalms," but haven't done much with it, so I prayed Psalm 19. As I prayed, I reworded the Psalm to be a prayer. The following is not what I prayed, but my attempt to make Psalm 19 into a prayer. The earth proclaims your work. Each night declares your knowledge. strong and unchanging in its passage. the entire world feels the heat. It revives my weary soul. and they speak to me of understanding. and they open my eyes. and that it will be everlasting. You are truth and righteousness. even from the sweetest honeycomb. Do not let me be led astray. so that I shall be blameless in your forgiveness. Righteous by your grace alone. my Lord and my Redeemer. This text suggests that every single person in the church matters....This is a reality we can name, which has less to do with equality than with wholeness. Only with all of our members can the body of the church be whole. Many of us would take it as a tenant of our faith that everyone should be welcome in the Body of Christ. This passage asks us to consider more than that, I think. We worry about church numbers, and seek to find ways to encourage people to attend church. Sometimes those two thoughts are so closely bound to each other that we are seeking members so increase our church's membership. That's not evangelism. That's recruitment, and it's not what we are called to do. Sometimes we talk about everyone being welcome in church because we have a belief that everyone should be welcome. That's not bad, but that's not what this quote talks about. That motivation makes inclusion a matter of equality. "You are welcome here because I am welcome here." It's good, but it's not complete. Imagine your body without one of its parts. You don't think you need a foot because the hand is welcome to join, and if the hand is welcome, then the foot must also be welcome. You don't keep your nose around because you need to meet a quota for body parts, and the nose counts. The body is one unit with many parts. Together, the body is complete. Have we ever considered that we must reach out to others to include them in the body Christ because without them, the body is incomplete? Evangelism isn't a matter of increasing membership or treating everyone the same; evangelism is reaching out to other parts of the body because we must -- because we are incomplete without them. Note: The body metaphor breaks down when brought into reality. Please don't draw the conclusion that I think that those people missing body parts are not complete. They are. How do we see each other? I'm reading a book called The Anatomy of Peace; Resolving the Heart of Conflict. I'm a member of our Annual Conference's Covenant Council, and we've been asked to read this book in preparation for an upcoming meeting. To be honest, I wouldn't have chosen this book to read on my own, but as I read it this morning, the following thoughts came to mind. The deepest way in which we are right or wrong...is in our way of being with toward others. I can be irght on the surface -- in my behavior or positions -- while being entrely mistaken beneath, in my way of being. To have a heart at peace, and to resolve conflict, one must see the other person as a person, rather than as an object. Think about that for a minute, as I did. When you are in a situation of conflict, do you see the other person as an enemy, or as a person? Doesn't it seem like the most important goal, when you are in conflict, is to win? To prove the other person wrong? What if it didn't matter as much who was right or wrong, but instead what was really important was how we respond to each other? What would happen? Perhaps this is the meaning of Christ's words -- love one another. See each other as persons. The devotional I was reading this afternoon talks about a time that the author was climbing a hill near a retreat center in Cody, Wyoming. Along the way were piles of stones. The author imagined that they were placed there as people prayed special prayers. The stones themselves were speaking the prayers of the people. I was reminded of a headstone I photographed near Flatwoods, WV. 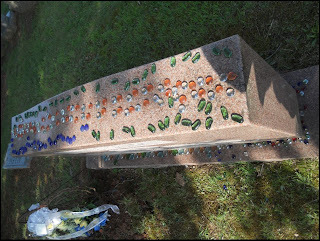 It was covered with glass stones, laid in patterns on the headstone. I wondered why they were there. I wonder if each time a loved one visited the grave, if a stone was placed in prayer. Joe spoke with the children during the Children's Moment this past Sunday. He brought clay prayer bowls and small, round prayer balls. With each prayer, the user places a ball in the bowl, to symbolize the prayer sent to God. Rocks, glass stones, clay balls -- all speaking the prayers of the people. As Psalm 19 says, "the heavens are telling the glory of God; and the firmament proclaims his handiwork." May God hear our prayers. Amen. I was reading this morning from the Daily Feast. The meditation was based on I Corinthians 12 -- a variety of gifts but one body. The author, Raewynne J. Whiteley, says, "Gifts are not merit badges for holiness or signs of approval from God, but God's response to the needs of our communities." So often we think - if we think about gifts in our churches at all -- that we need to find ministries in which to plug people so that they can use their gifts. You are a gifted teacher? Then here is a Sunday school class for you. Could it be that we are doing it backwards? Should we be assessing what gifts God has given our community and then building the ministry based on the gifts we possess? Could it be that if God has graced our community with certain gifts then he has done so because he knows we need the gifts to do the work he has planned for us? Perhaps a better way to plan ministry is to determine our gifts and then see how those gifts can be used in the work God has planned for us -- so that the gifts lead the way to the ministry. We were out of town this last weekend. If I had planned a little better, we would have gone to church Sunday morning at a United Methodist Congregation somewhere close to where we were, but the planning came too late and the services started too early. I was up earlier than the rest of the family and spent some time knitting and listening to podcasts. I chose to listen to Adam Hamilton's sermon from the Sunday before. It was a great sermon, and sitting near the lake, listening to his words, it felt like worship. What it didn't feel like, though, was church. It occurred to me, listening, that there is a difference. I can worship alone, beside a lake, listening to the words of a pastor spoken a week before in Kansas. I'm certain God is there with me. But it isn't church. Church requires other people. We were made to be in relationship. Church -- the body of Christ -- is bigger than any one of us. We can't be part of church without being with the church. We can worship, and it can be an experience of the near presence of God, but we need church. We need to be part of the body of Christ. I was reading a devotional from Daily Feast this morning. The author asks us to picture what it was like when Jesus was baptized. Everyone was gathered around, waiting to be baptized. Jesus joined the crowd in line. Those around him were like us -- sinners in need of grace, the lost in need of forgiveness. Jesus wasn't either one of those, and yet he joins those there in solidarity. That doesn't just mean that Jesus stands with us, protected and observing. It means that Jesus -- God -- is with us. Experiencing what we experience. Feeling our pain. Knowing our suffering. Isaiah 42:2 says, "When you pass through the waters, I will be with you, and through the rivers, they shall not overwhelm you." Jesus passed through the waters of baptism with us, and we with him. Part of my plan, shared with my reunion group this week, is to see the good things that people are doing rather than picking on the not so good things. Do you do that? Do you focus on the negatives rather than the positives? It wrecks my attitude, and makes me negative. I am generally a positive, optimistic person, so when I start focusing on the negative, it changes the way I see what is around me. There is a scene in the movie Evan Almighty when God is talking to Evan's wife. She has prayed for patience (or something like that) and God tells her that she will gain patience when facing situations that try her patience. (I am so much rewording this scene that I've probably completely rewritten it. Anyway, it's unexpected that the week I plan to see the positive instead of the negative has been a challenging week to do so. and I have redeemed you. I call you by name. You can breathe because I give you life. You can stand fast because I hold you. You will survive because I surround you. I have given everything for you. I have given my son for you. My sons and daughters, I have saved you. In Sunday school yesterday, a member of the class said that in order to be saved, one must pray a particular prayer. I know there are people who believe that, but I'm not one of them. I know there are people who can point to a specific moment in time when they accepted Christ as savior and knew that they were saved. I have always believed in God, I have always believed in Christ, and I can't point to a particular point in my life -- a particular moment -- when I went from lost to saved. The devotional today is written by a man who was raised Jewish, but is now Christian. He is often asked how that change came to be, and when he was baptized. He says it is a difficult question to answer. So many events in his life were the workings of God. He describes the wind that "blows where it chooses, and you hear the sound of it, but you do not know where it comes from or where it goes" (John 3:8). I have an Emmaus reunion group meeting tonight, and one of the questions we ask each other is "when this week were you closest to God?" Was reading this devotional my closest moment to God? It might be. Reading of this man's experience of "trying to sum up a lifetime of accepting the word of God" felt like God reminding me of his loving presence in my life. Always. When was I baptized? When I was seven, in a white dress standing in a Presbyterian Church. When was I baptized? God is at work every day, and the spirit blows where it will. That experience of God seems more monumental in my life than the work of one day, as grateful as I am for it. Advent beckons us into the nonsensical paradox of God in which deep truths can be found. Sense found in nonsense. Truth found in paradox. To gain, we must lose. In dying, we will live. The first will be last. To live, we must die. What deep truth can be found in the paradoxes of our faith? The first, most simplistic answer I have is that what we are taught is of value as members of society is wrong. What we hope to gain -- money, wealth, success, security -- isn't worth gaining. What is of value, isn't valued. In order to trying live, we must die to what we think we hold dear, and at dying, we will find life -- here, on earth, and then later. The Glory of the Lord has risen upon you. Do you see a world covered in darkness? Do you cry as children are shot? Do you weep over the lack of justice in the world? Is your life surrounded by darkness? The Lord will rise above you. Open your hearts and see God's Glory. In all that you do for God. Nations shall come to your light. Shine, and see the world transformed. Lift up your eyes and look around. See the darkness scatter at God's light. Children will come to the dawning. Those who were scattered will join together. In God there is no darkness at all. In God, there is light. In you, there is God's light.